Plant invasions in Great Lakes wetlands are strongly influenced by nitrogen loading. The invaders Phragmites australis and Typha x glauca are often managed with varying degrees of long-term success, in part due to the persistence of N loading. However, even if N loading were decreased, the wetland ecosystem could potentially stay in an invaded state because of a regime shift to higher plant-sediment N cycling, maintaining invader dominance. We studied this using the Mondrian model, a wetland community-ecosystem model. In our simulations, even after a major reduction in N loading, in flooded conditions, these invasive species continued to dominate the community and did not return to pre-invasion levels. However, lower water levels allowed N cycling to return to nearly pre-invasion levels, partially reducing the dominance of the invaders. William (Bill) S. Currie is a Professor of Environment and Sustainability at the University of Michigan. He studies ecosystems and human societies as coupled human-natural systems in which the ecological, economic, and social dimensions are interwoven in complex feedbacks. This is a key perspective used in the growing field of sustainability science. 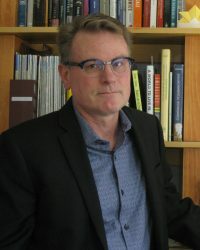 Having a background in physics and engineering, Prof. Currie leads the development of ecosystem computer models, often working in collaborative groups where a model is used to provide synthesis and increased understanding of applied problems. With strong interdisciplinary interests, Currie is committed to the idea that researchers must work together across traditional fields to address the complex, large-scale, interconnected environmental and sustainability issues of the 21st century.